I like to think of a quesadilla as the Central American cheese toastie – glorious, oozing cheese between two tortillas. There are a few ways to cook them, but I went for the dry hot pan as I think it gives it all a nice crisp. The beans were both delicious and nutritious, but you could of course put in just about anything! Grated cheese – I used a medium hot mexicana, but any hard cheese will work. Beans – I used a tinned mixture. Kidney beans, pinto beans etc. In a bowl mix the beans with a teaspoon or two each of the spices and onion powder. Use your hands to crush the beans a little. If using a tinned mixture, as I did, leave a little of the aquafaba (bean water) in the mixture to help it all bind. Add the sweetcorn and combine well. Top a tortilla with the grated cheese, then a layer of the bean mixture. Don’t spread it right to the edge, as it will spill and ooze out in the pan. Heat a large frying pan (without oil – use nonstick) and cook the quesadilla for a couple of minutes on each side. Slice and serve immediately. 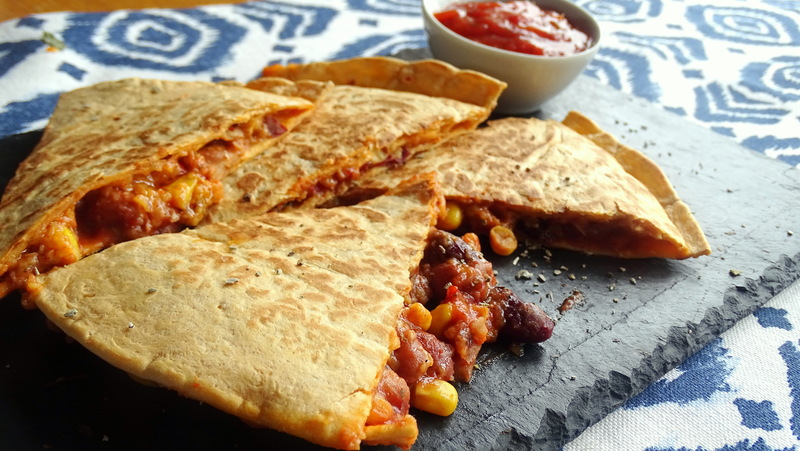 Posted in Guesscipes, Mains, VegetarianTagged beans, cheese, food, guesscipe, mexican, quesadilla, recipe, spicy, tortilla, VegetarianBookmark the permalink.